Analysts are often asked to perform phone toll analysis, which is the act of analyzing call records to see who called whom, when and how frequently. 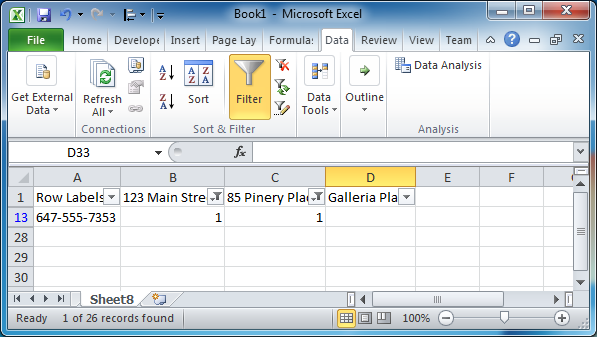 There are commercial tools for performing such an analysis but I’ve found Excel can easily get the smaller jobs done. In a typical phone toll analysis you have some numbers of interest, suspect numbers or the numbers of known associates, that you want to study in depth. The technique I am going to demonstrate below is not applicable to that kind of analysis. 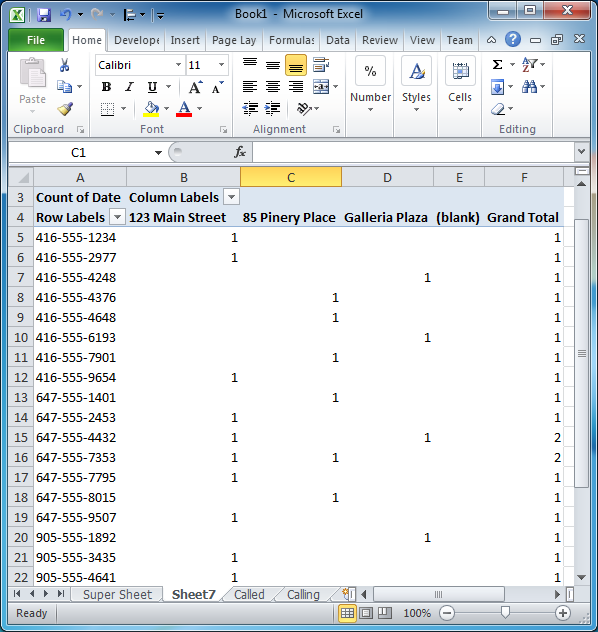 Rather, I am going to detail how to use Excel pivot tables to perform a different kind of phone toll analysis useful for when you are interested in number discovery. The scenario is as follows: there have been three incidents with the same MO and it is likely that the same suspects are committing the crimes. You don’t have any suspect descriptions but you do have the exact location and time of each of the incidents. Working on a hunch that the suspects are using their phones during or shortly after the crimes your detectives secure a warrant for all cell activity in each of the three incident locations for each of the three occurrence intervals from all the major cell carriers. They then email you this data and ask you to do an analysis. The first step is to sort out the data. Every carrier organizes their data differently but the common elements between them all are called number, calling number and the date and time of the call (sometimes combined as date time). 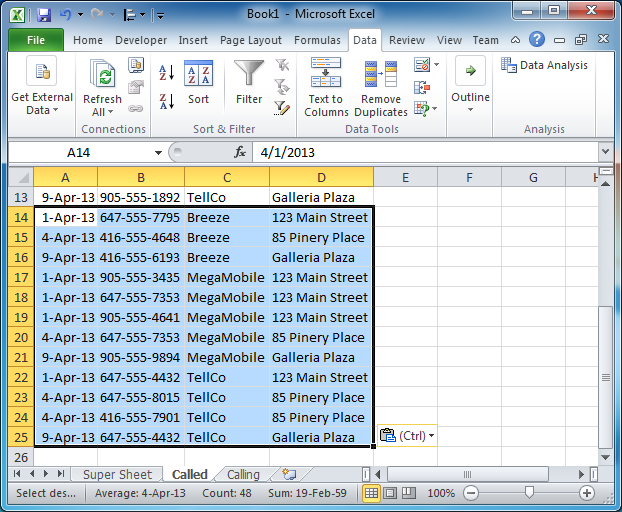 To normalize the data first create a new spreadsheet with columns for date, called number, calling number, carrier and location. These last two will need to be manually added to the spreadsheet based on data from the carrier and are used to differentiate the data between carriers. The intention of this step is to create a single ‘super sheet’ that combines all the calls made across all the carriers into one big list. The stripped down super sheet in the screen grab below lists only 12 calls across three carriers but it’s quite possible that in a real life example you could be looking at thousands upon thousands of calls (depending on the size of your time interval and the size of your cell phone market). After normalizing the data the second step is to make two copies of the super sheet (leaving the original as a source file). 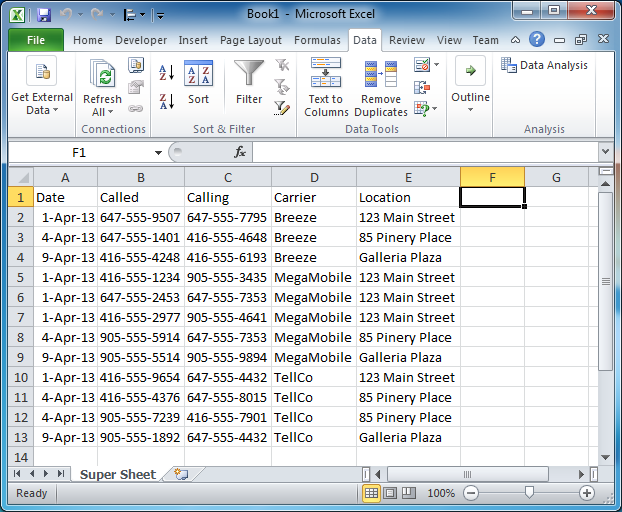 In the first copy, delete the ‘Called’ column and in the second copy delete the ‘Calling’ column. Finally copy all the data from the second sheet and paste it at the bottom of the data in the first copy and rename the column with the phone numbers in it as ‘Number’. The point of this step is to wipe out the difference between called and calling number since, when we’re fishing for common numbers, we don’t want to just rely on one or the other in case during one incident the suspect was the caller but in another the suspect was the called number. In the screen short below I pasted in the content from the ‘Calling’ sheet to the bottom of the data in the ‘Called’ sheet and even though you can’t see the column named in the shot I renamed column 2 to ‘Number’. 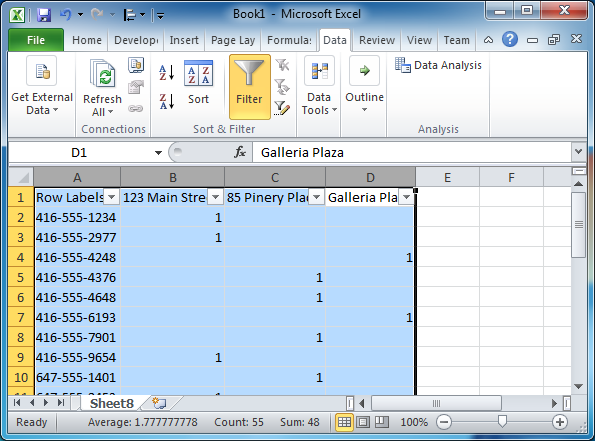 The third step is to create a pivot table from the combined work sheet with the single ‘Number’ column. Highlight the whole thing and insert a pivot table using the PivotTable button under the ‘Insert’ tab (see screen shot below). In the new pivot table work sheet drag the ‘Number’ column to the ‘Row Labels’ box and the ‘Location’ field to the ‘Column Labels’ box. Finally, drag the ‘Date’ field to be the ‘Values’ box to get something similar to the screen shot below. What you’ll likely see (depending on how many sources numbers you have) is a very long pivot table with a lot of blank spaces. What you need to do is copy the entire table and paste its values into a new worksheet so that it can be manipulated. After pasting, highlight the data and apply a data filter so that each column has the drop down arrows for filtering out values. Now it’s time to search for common numbers. If, as we hope, the same crew committed all the crimes and they used their phones during the different crimes then there should be numbers that have non-zero values in more than one column. 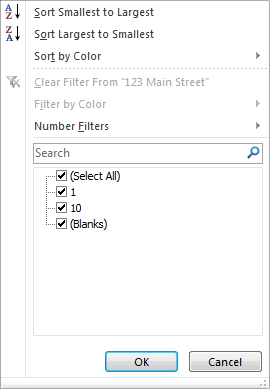 In order to more easily identify the numbers use the filter drop down on the first location column (123 Main Street in the example) and deselect the (Blank) option. This should shrink the list considerably. Now, do the same thing on the second column be deselecting the (Blank) option. Any phone numbers that remain were used in both locations during the incidents. By re-selecting (Blank) for the second column and de-selecting (Blank) in the third column you can check for common numbers between the first and third locations as well. And finally, by re-selecting (Blank) in all the columns and then de-selecting it for two and three you can find common numbers for those two addresses. You only need to do those three combinations as all other combinations (e.g. three then two, three then one, etc) are just reversals of what’s already been done and you’ll get the same results. 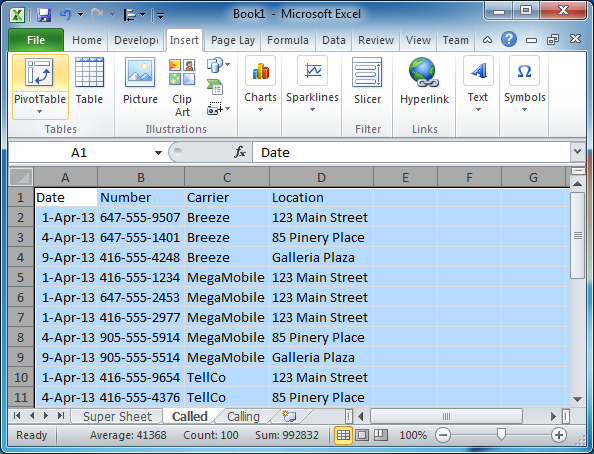 By noting down what numbers are common and then applying a filter to the original super sheet that maintained the called/calling split it is possible to find the carrier. You can then examine the original carrier documents to get more details and provide your detectives with a list of numbers they can follow up on. One note, try googling the common numbers that you find before you send them off to your detectives. Often common numbers are things like the carrier’s voice mail number or a public service phone number for the municipality. The good thing is that if the number is one that the general public might use it will likely be heavily promoted on websites and show up near the top of search results. By pre-identifying common numbers you can save your detectives the potential embarrassment of asking a carrier for details on their voice mail service.